With Zika outbreak, Brazil's slump is becoming a nightmare. 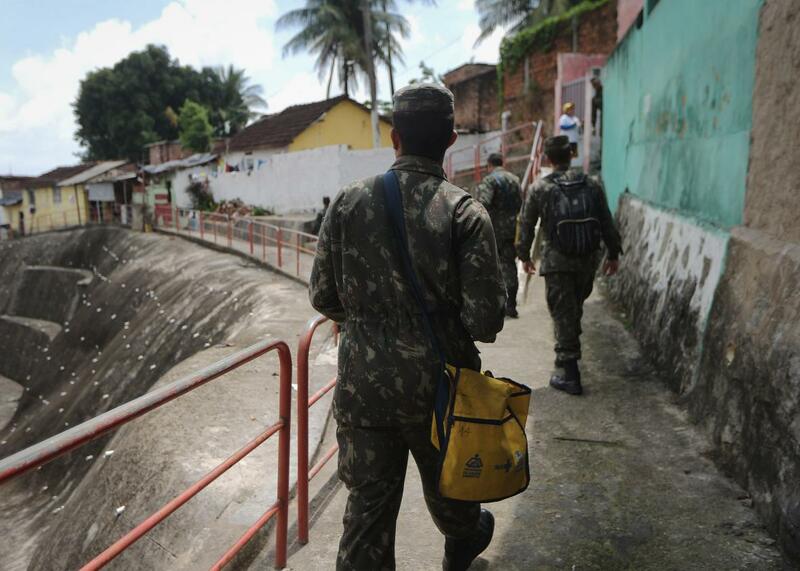 Brazilian Army soldiers canvass a neighborhood informing the public of preventive methods in an effort to eradicate the mosquitos which transmit the Zika virus on January 27, 2016 in Recife, Pernambuco state, Brazil. Brazil is justifiably concerned that the ongoing Zika virus outbreak could deter visitors from this summer’s Olympics in Rio de Janeiro, and has announced plans to prevent the spread of the mosquito-borne disease during the games in August, including inspections and daily sweeps for insect breeding grounds. Zika, which is spreading rapidly throughout Latin America, has been linked to an unusually high number of cases of microcephaly, a birth defect that causes babies to be born with unusually small heads. The U.S. Centers for Disease Control has advised pregnant women to avoid travel to a number of countries, including Brazil, where transmission of the disease is ongoing. Though the fever caused by Zika isn’t that dangerous for people who are not pregnant, it seems likely that the warning will make travelers jittery, casting a pall over the event as well as Brazil’s lucrative tourist industry as a whole. The tragedy of Zika is grim enough, but it also comes at a jittery time for the world’s fifth largest country. Brazil is in the midst of a crippling recession, with the very recently booming economy expected to contract by nearly 3 percent this year. The ongoing slowdown of China’s economy, which is heavily linked with Brazil’s, is making matters worse. Fitch recently cut Brazil’s credit rating to junk status and the unemployment rate is soaring. That’s not all. Many of country’s top officials, including President Dilma Rousseff, are enmeshed in a massive and wide-ranging corruption scandal involving bridges for contracts with Petrobras, the country’s main oil company. Massive protests were held last year calling for Rousseff’s impeachment and the country took the biggest tumble in Transparency International’s annual Corruption Perception Index, released this week. The Olympics, following the 2014 World Cup, were supposed to give Latin America’s rising (relatively) superpower an opportunity to shine in the global spotlight. Instead, the preparation for the games have mostly yielded allegations of human rights abuses and embarrassing stories about Rio de Janeiro’s water quality. And all that was before the emergence of Zika, the most unnerving and heartbreaking crisis of them all.